Since assassins, same as other violent criminals, get to choose the time and the place of the attack, they often land the first hit before the victim can respond. To that end, concealable armor can be a lifesaver. 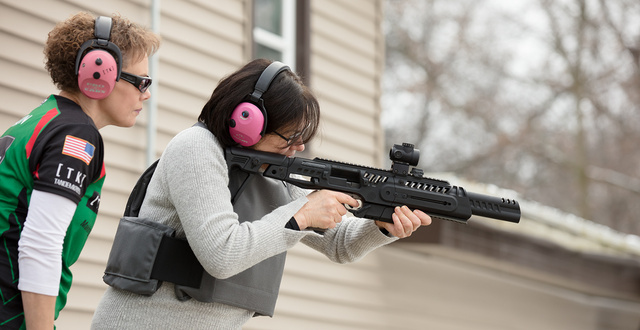 The example above is barely concealable — it’s a plate carrier with soft armor and trauma pads underneath — but it would pass detection under a business suit. In the US, a lot of public school teachers are in worse position than diplomats — open to predation and legally prohibited from going armed. Armor would provide a better chance of surviving an attack with pistol or a knife slash. Might make a good Christmas present for family — peace…or at least survival on earth. This entry was posted in armor, rifle, self-defense, weapon and tagged 9x19. Bookmark the permalink. This is a good and timely advice for everyone. Excellent image. I love the colors and soft lighting. In many states armor is more regulated and propagandized than firearms. The federal and state LE “community” may hate the idea of “civilians” having body armor more than they do us having guns. 1) No armor if you’re a felon. 2) No armor if you’re committing a crime. Beyond those two rules, the only restrictions I have are product availability and my bank account. I know there are a few states that have more rules, like Connecticut’s requirement all purchases be made in-person, and there may be some smaller jurisdictions with particular rules, but the USA is pretty permissive when it comes to body armor. Isn’t that interesting? It’s purely defensive hardware. Reminds one of Russia’s moaning and groaning about NATO missile-defense installations in eastern europe. Texas prohibits the possession of body armor, but only for those convicted of a felony. Teachers and staff at one of our “gun free” private schools recently went through a rather expensive class where they got to throw things, like staplers, at “bad guys” firing blanks. OTOH the Texas Association of School Boards says that over 10% of Texas public school districts have teacher carry. The Fed’s prohibit anyone convicted of any crime from owning armor. Armor is considered an OFFENSIVE weapon , just like your DEFENSIVE handgun is.